Sunrise at Southwest Harbor, Maine. As the largest island off the coast of Maine and the home of Acadia National Park, Mount Desert Island is well known for its natural beauty and recreational opportunities. Each summer, thousands of visitors flock to the area, although the island is spectacular in every season. Bar Harbor is perhaps the best-known town on Mount Desert Island, serving as a popular starting point for visitors to Acadia National Park. However, Southwest Harbor, Northeast Harbor, Somesville, and other small villages ooze coastal Maine charm, making them excellent choices for visitors. With a population of approximately 2,000 permanent residents, Southwest Harbor is located on Mount Desert Island’s “quiet side,” which receives dramatically fewer visitors than the Bar Harbor area. The town has a prime location at the southwestern entrance to Somes Sound, which features rocky shoreline and beautiful ocean views. Many visitors to Acadia National Park stay in Southwest Harbor for its calmer, more relaxing pace in comparison to other Mount Desert Island locales. 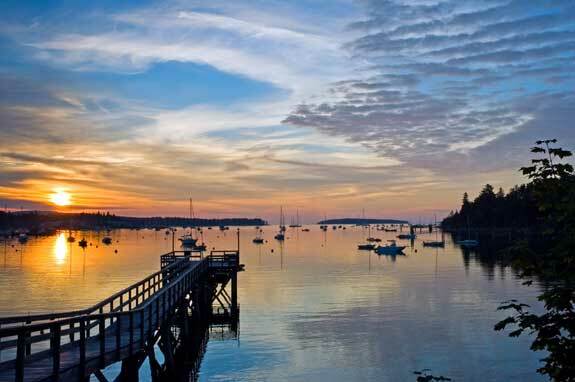 Southwest Harbor is deeply tied to the ocean, making it a popular starting point for island excursions and sightseeing. Several tour companies offer cruises to nearby islands, whale-watching, wildlife viewing, and lobstering experiences. Adventurous visitors also enjoy sea kayaking from Southwest Harbor; guided tours are available from several outfitters. Many kayakers consider the Mount Desert Island area to be one of the premier sea kayaking destinations in the world. In addition to its natural beauty, Southwest Harbor has a variety of cultural opportunities. The Seal Cove Auto Museum features antique cars, while the Wendell Gilley Museum offers a look at decorative bird carving. Art lovers will enjoy the three-week Summer Festival of the Arts, which offers classes in crafts, music, theater, dance, creative writing, filmmaking, and other artistic pursuits. Each autumn, the annual Mount Desert Island Marathon begins in Bar Harbor and travels the island before terminating in Southwest Harbor. The marathon is popular because of its stunning roadside scenery and passage through Acadia National Park. It may be more difficult to find available accommodations during the marathon weekend. Most visitors to Southwest Harbor stay in inns or bed-and-breakfasts. These local establishments are frequently owned by families, providing excellent service and comfortable amenities to guests. If you prefer more independence, consider renting a vacation home in Southwest Harbor. A number of homeowners rent their properties to vacationers; this is a popular option with families or large groups who prefer to stay in the same location. When venturing out of your inn to sample the local cuisine, you will be met with a wide variety of dining options. From fine dining at a nice restaurant to classic Maine pub food at the local tavern, Southwest Harbor has something for everyone. Lobster and seafood dishes are an integral part of many dining menus; taste the local specialty for a meal to remember. When you’re finished eating, visit the beloved Quietside Cafe and Ice Cream Shop for an after-dinner treat. Northeast Harbor is located directly across the Somes Sound from Southwest Harbor. Although the village has few permanent residents, its population swells dramatically in the summer months. Famous summer residents include the Rockefeller family, Barbara Bel Geddes, and the late Brooke Astor. Historically, wealthy Philadelphia residents would summer in Northeast Harbor, earning it the nickname “Philadelphia on the rocks.” Today, visitors to Northeast Harbor find a slow-paced, classic town with an authentic Maine feel. Northeast Harbor is located very close to Acadia National Park, making it a good jumping-off point for those visiting the park. Numerous yachting organizations and cruise boats depart from Northeast Harbor for nearby islands. Walk down to Clifton Dock to gaze across the sound at Mount Desert Island’s beautiful scenery. Consider visiting the Northeast Harbor Golf Club for a round of golf; the historic course is over 100 years old. One of the most popular attractions in Northeast Harbor is Astacou Azalea Garden. In 1956, Charles K. Savage designed and built the garden. Savage’s love of native Maine plants and Japanese garden design were the inspiration for this magnificent garden. The garden features a circular path that passes through several rooms. This carefully designed space creates a delicate contrast between the beautiful flowering plants, rocks, and a raked sand garden. The Azalean Garden is lovely throughout the year, with a flowering cherry tree blooming in mid-May; azaleas and rhododendrons in late May and June; Japanese iris, rosebay rhododendron, sweet azalea, and smoke bush in July; water lilies in August; and autumn colors in September and October. The Thuya Garden is another popular attraction, with its semi-formal English garden style bordering native eastern Maine woodlands. Located on a granite hillside, the garden provides an excellent view of Northeast Harbor. The downtown area of Northeast Harbor features excellent shopping opportunities, with boutiques and small art galleries. Browse authentic Maine crafts, jewelry, books, fine art, clothing, sea glass art, gardening tools, and antiques in the small stores that dot the downtown Northeast Harbor area. The premier lodging choice in Northeast Harbor is the Asticou Inn. Founded in 1883, the inn has been restored to its early 20th century style. The famous azalea gardens are located just across from the Asticou Inn. Several other inns and bed-and-breakfasts are available in Northeast Harbor, as are vacation rentals. There are several fine restaurants in Northeast Harbor. Many of them feature American food, with local seafood available on nearly every menu. After watching lobstermen hauling in the day’s catch on a cruise or waterfront excursion, enjoy a lobster feast in one of Northeast Harbor’s excellent seafood restaurants. Mount Desert Island was formed over 500 million years ago by the movement of a massive glacier, forming its rocky, mountainous landscape. The Somes Sound was carved out of the island during the last glacial event, giving it a unique curved “U” shape. Somesville sits at the north end of the Somes Sound. It was founded by Abraham and Hanna Somes, the first settlers to live on Mount Desert Island. Since that time, Somesville has been popular with Maine residents as well as visitors. Somesville offers a multitude of recreational opportunities. Extensive hiking trails to both sides of Mount Desert Island area accessible from the town. Somesville is conveniently located near clear lakes and ponds that are perfect for freshwater kayaking or canoeing. Alternatively, take your kayak to Some Sound to tackle its moderate ocean surf. The Somesville Footbridge is one of the most iconic and frequently photographed places on Mount Desert Island. Access the footbridge by taking Route 102 on the west side of the sound. Although the footbridge is beautiful in all seasons, it is especially lovely during the autumn months, when the fall colors contrast nicely with its classic white arch. The Somesville Historical Museum and Gardens, managed by the Mount Desert Island Historical Society, also draws visitors throughout the high season. The museum, located near the footbridge, was constructed in 1981 to house Mount Desert Island historical pieces. Beautiful gardens with classic 19th and 20th century native plants are in bloom from May to October. The museum is open Tuesday through Saturday from June 1 to October 15. Hours are from 1:00 p.m. to 4:00 p.m. While lodging and dining options in Somesville are limited, nearby Bar Harbor, Southwest Harbor, and Northeast Harbor have a variety of amenities. Mount Desert Island is dotted with other small communities, many of which have very little tourist infrastructure. Bass Harbor, located on the “quiet side” of the island, is home to the famous Bass Harbor Head Lighthouse. Established in 1858, this lighthouse has a rich history of protecting ships passing near Mount Desert Island. Although the keeper’s house is privately owned, visitors may explore the lighthouse station. Consider taking a cruise to view this beautiful lighthouse from the water. Another way to view the lighthouse from the water is to take a ferry. The Bass Harbor Terminal, managed by the Maine State Ferry Service, offers ferries to Swan’s Island and Frenchboro. For a unique tourist attraction, head to Timber Tina’s Great Maine Lumberjack Show. Located in Trenton, the facility teaches individuals of all ages basic lumberjack sports, including log rolling, cross-cut sawing, and axe throwing. Professionals demonstrate their skills during the evening from mid-June through Labor Day. Manset, a small village that is technically a part of Southwest Harbor, is known for its excellent views of nearby Cadillac Mountain and Bear Island. The Bear Island Lighthouse, established in 1839, is still active and does not permit visitors. This lighthouse is best seen from the waterfront in Manset. The small Mount Desert Island towns of Tremont, Bernard, and Seal Harbor are other great places to take in ocean scenery, explore charming boutique shops, and access spectacular hiking trails. Consider renting sea kayaks from a local outfitter to explore the rocky coast and get a unique view of these small seaside villages. Most of these tiny towns do not have accommodations, but vacation rentals may be available nearby. Visit the following directories to find lodging, dining, attractions, shops, services and recreational activities in the Southwest Harbor, Maine area.